This year marks the 75th year of the National Baseball Hall of Fame and the weekend of July 25th, 2014 most certainly memorable for the inductees: Frank “Big Hurt” Thomas, Greg Maddux, Tom Glavine, Bobby Cox, Tony La Russa, and Joe Torre. Very memorable for me too as Cal Ripken, Jr. invited me to join him knowing that the only way this could work was if he “carried my bags”. I had recently come off colon surgery (doing fine) and was under serious orders from the surgeon and Elaine to lift nothing. Cal did this with good humor and grace. As one can imagine, this weekend at Cooperstown was a great experience at every level- whether simply walking through town while Cal rode his bike 25 miles around the lake, having lunch on Saturday at the Blue Mingo listening to he and Harold Reynolds exchange Orioles’ tales, or watching as Billy Crystal, Tom Brokaw, Reggie Jackson and numerous Hall of Famers sought out Cal. I wanted herein to share some of my own “takeaways” and attempt to incorporate a few photos via my IPAD. Being technically challenged, the latter did not come easily but I am glad I gave it a shot, no pun intended. The picture above was taken from the porch of the grand Otesaga Hotel which opened in 1909. The picture below was taken from this porch and overlooks the south end of Otsego Lake, aka “Glimmerglass” in James Fenimore Cooper’s novels. A beautiful spot to have a meal or a drink. 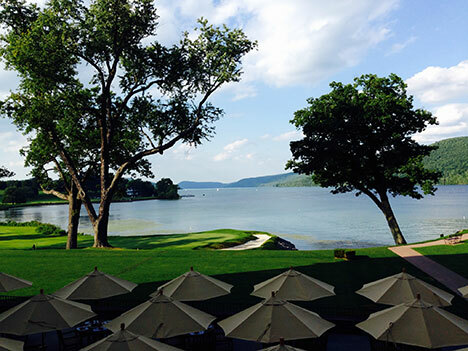 Even if you are not a baseball fan, spending time in Cooperstown and the Otesaga takes you back in time and seems to slow it down in the best ways. The hotel is now owned by the Clark Family. 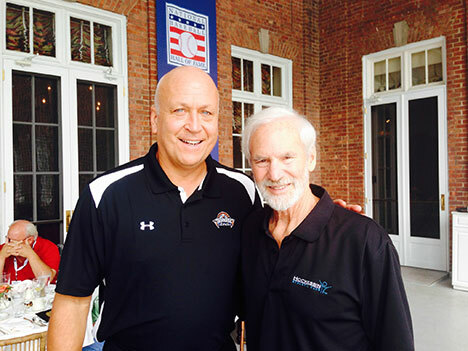 Their contributions to the village of Cooperstown and environs- $7,000,000+ annually has helped make the village of Cooperstown a national treasure. Jane Forbes Clark is the Chair of the National Baseball Hall of Fame and the host of the Hall’s annual induction ceremony. Welcoming an estimated crowd of @48,000 on Sunday she said: In the history of professional baseball, of the 18,000 who have played the game at that level, only 211 ( 0017%) have ever been inducted into the Hall of Fame. 50 of the 66 living members were there in 2014. 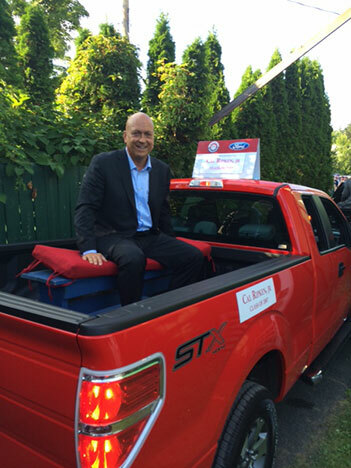 Cal riding in the Parade of Hall of Famers on Saturday. 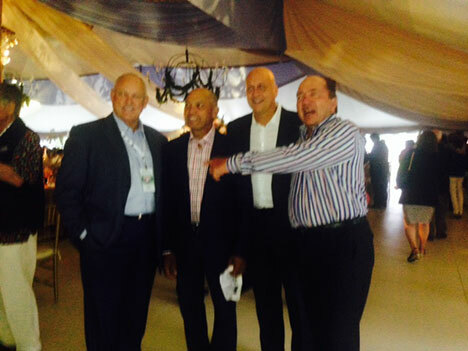 Nolan Ryan, a thin Reggie Jackson, Cal and a pointing Johnny Bench on Friday night. 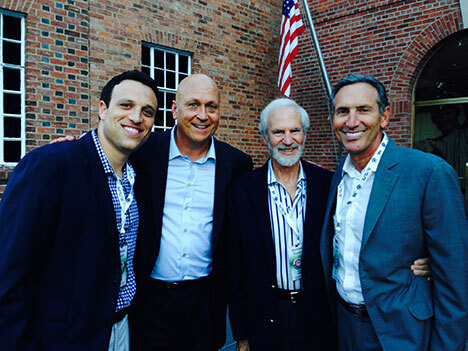 Purely by chance, on Saturday night we had dinner with Howard Schultz and his son, Jordan. Howard and Jordan were free for dinner and when Cal finished signing we returned to the Otesaga and had dinner on their porch. his job, and seemed well grounded. that might help and inspire the average business owner or non-profit leader. More re this later. 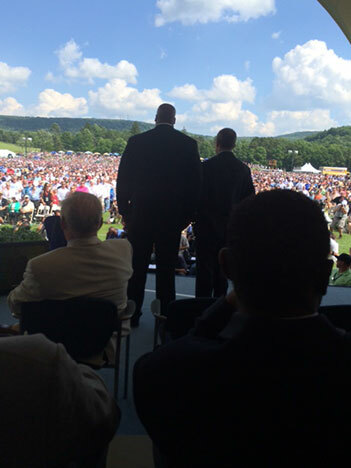 This is a shot Cal took of the “Big Hurt” from the stage just before he was officially inducted into the Hall of Fame. This is not a small man. Des Bieler, Washington Post, wrote: “Thomas’s (HOF) speech was easily the emotional highlight of the day. To hear the big man tell it, he wasn’t necessarily planning for that to be the case.” Here is what Thomas told mlb.com: ‘So for me today, to be honest with you, I was Cool Hand Luke sitting there watching everyone’s speeches. As soon as I stood up, my knees started shaking and the first thing I looked at was my mom. It hit me right in my heart. My mom hadn’t left Columbus, Georgia in 15 years. She was here today and I just started crying.’ Thomas, a five time All Star, was elected to the Hall of Fame in his first year of eligibility. Thanks to Mr. Google I learned the “Big Hurt” made the All Star team five times, had a lifetime batting average of 301, and was the American League comeback player of the year in 2000. He was born in Columbus, Georgia in 1968. Four years before that I had spent time in his home town receiving infantry officers training at Fort Benning which was located there. Though I cannot remember a lot about Columbus as we did not get off base much, I vividly remember the drive South from my small home town of Easton, Pennsylvania. Seared in my memory from that trip was crossing into Georgia and soon seeing hand painted white signs lettered in red advertising a local Klu Klux Klan meeting. Sadly, they are still at it today- and it’s 2014 not 1963. After penning this last sentence I simply stopped writing questioning why I was even making this reference to an old but for me significant memory infrequently recalled. 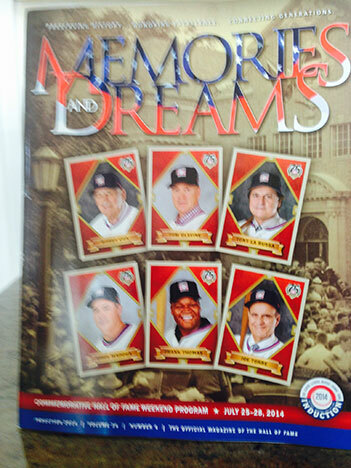 Wasn’t this something way out of left field in the context of a special Cooperstown weekend? And who cares? The truth is I do. As I age the more I believe the connection an individual makes with people, events, concepts, and time are not by accident. The history of baseball is intertwined and inseparable from the country’s social history. In real time a Jackie Robinson All Star team of eleven and twelve year olds from Chicago’s south side beat a team from Las Vegas while the events of Ferguson are transpiring. They will represent the United States in the 2014 Championship Game against Korea. I know little of the team’s history, how the league got started, what the kids were like, what they think of how and where they’ve come or even if they do. But I know behind each of these kids is a LEADERSHIP STORY – a mother, a father, a sibling, a grandparent, a coach, a teacher, a Boys and Girls Club staffer, or spiritual inspiration. Thinking about the juxtaposition of the two stories- South side Chicago Little League Champs inspires a city; Ferguson, Missouri police shooting of a black teenager depresses country- I wonder what the “culture” was like on the Jackie Robinson team that made them so successful and why the “culture” of police/community relations might have caused rather than prevented this incident. All of which brings me back to several thoughts as I listened to Cal and Howard Schultz during dinner in that idyllic Cooperstown setting. The first was “holy cripes” how fortunate am I to be sitting here. The second was, now that’s a terrific Oregon pinot! 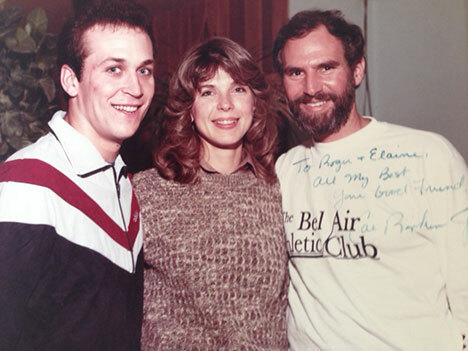 The third related to the impact Howard and Cal have had in their lifetimes. for 16 plus years coupled with the values and approach to everything that make Cal Cal. He and Cal do this naturally both because of what they have accomplished over the course of their professional careers (Howard turned 61 in July and Cal 54 in August) and the fact that they are aligned leaders. By this I simply mean their deeds match their words. As people they are humble and interested in others- a quality not normally associated with celebrities. Howard’s leadership of Starbucks and the leadership of Starbucks’ Board of Directors in 2014 sets an important example for present and future public companies. Starbucks is at the forefront of public companies financially successful long term that strategically use it’s resources and talent to help the country and local communities address complex social issues in broader and deeper ways. 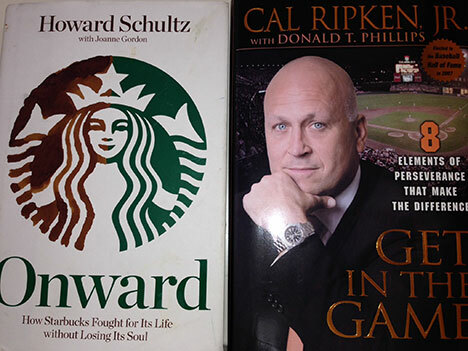 * In Cooperstown I asked Howard why he thought more public companies were not more like Starbucks in this arena. * He said this is very tough for public companies and especially so in difficult economic times. True, and I would add it also tough for small private companies as well. If there at all, it is usually a sidebar to their core business strategy. Cal, Vi, and Bill Ripken opening a CRSF turf field at the Aberdeen Boys and Girls Club, August 11, 2014. 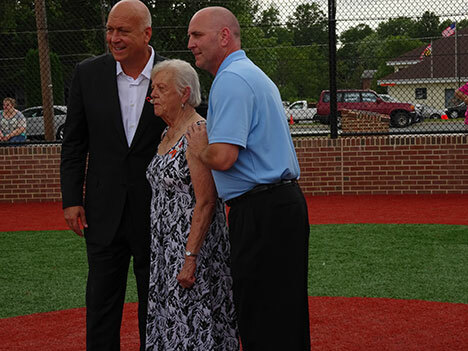 This field was named after Vi Ripken to honor her long time volunteer work at this club on behalf of youth. 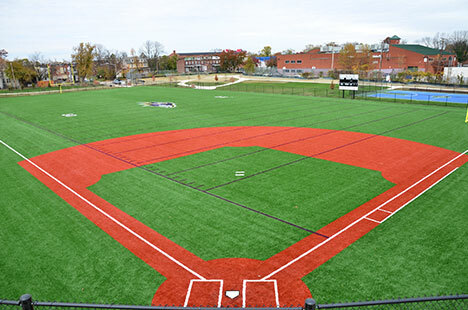 It was the 25th CRSF turf field to opened in disadvantaged neighborhoods across the United States. Many more will follow. The Foundation was started by Cal and Bill to honor the memory and legacy of their father. Both are heavily involved. CAL RIPKEN, JR.’S Hall of Fame Induction speech before an estimated 85,000 people (Cal and Tony Glynn were inducted) reflects well a lesser known side of Cal- he is thoughtful, caring, highly analytical, and focuses both on the big picture and the relevant details. His speech is quite unique in HOF annals in that it reflected not just on the past but the possibilities and responsibilities ahead. Pictured above are tangible results of Cal and Bill’s commitment. 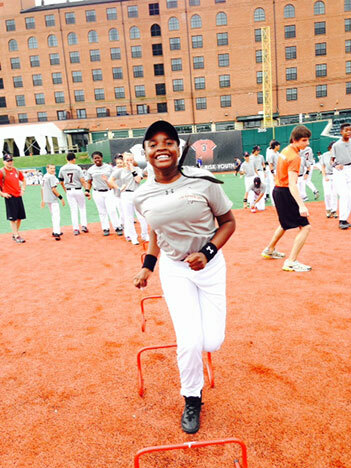 Caliyiah Lee from the Roy McBean Boys and Girls Club, Sarasota, Fl., doing drills at Cal Senior’s Yard in Cal’s home town of Aberdeen, Md. 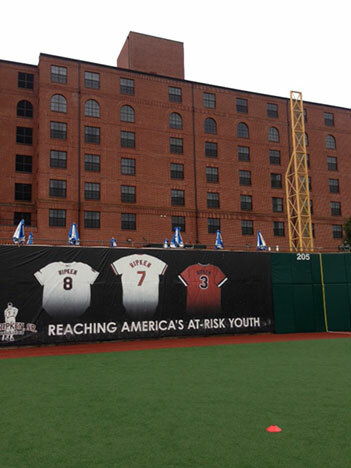 This is a youth sized CRSF field modeled after Camden Yards and Caliyiah was one of 675 sponsored kids from 23 different states attending one of our CRSF week long summer camps in 2014. She, like 90% of our campers, had never been on an airplane before. For some kids the experience and exposure has been life changing. 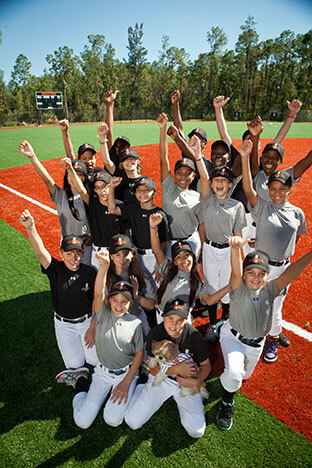 For some neighborhoods, their association with the Ripken Foundation has been a transformational vehicle because of the Foundation’s Badges for Baseball program and/or it’s multi-purpose Youth Development Park synthetic turf field program. The former is a joint program with law enforcement officers now operating in 100 communities across the country. It was initiated by former Chair and remarkable leader, Robbie Callaway. The latter was based on the insights and recommendation of the Foundation’s exceptional CEO, Steve Salem. We expect nearly 50 Youth Development Parks (YDP) to be in operation by the end of 2015. This is the only national program of its kind in the United States. From my perspective, the YDP formula established by the Foundation has significant inherent strengths and is scalable because it is a first rate customized tangible product done in partnership with local sponsors and incorporates character building programs developed by CRSF and others. The YDP below (right) is located in one of Baltimore’s most economically depressed areas, Park Heights. It opened in December 2013 and can be used for football, baseball, softball, and soccer. Operated by the city’s recreation department, it was funded by the CRSF, the Baltimore Ravens, the City of Baltimore, the State of Maryland, and private donors led by former Board Chair, Frank Kelly. In Naples, Florida our partner is the Boys and Girls Club. This $1.4M project was funded by Jay and Patty Baker. Jay, also a former CRSF Chair, took Kohl’s public. His involvement, spirit, and generosity are invaluable to CRSF. 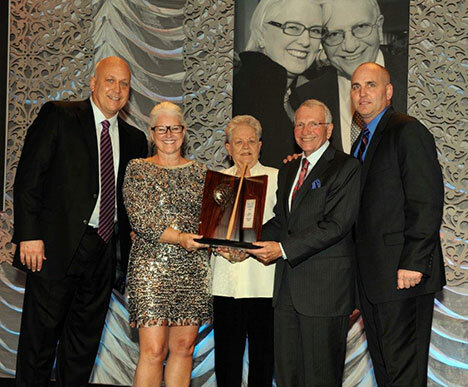 Bakers honored at CRSF 2013 “Aspire” event. In his hometown of Harrisburg, PA, CRSF’s current Chair, Mark Butler funded a Youth Development Park owned by the Boys and Girls Club of Harrisburg. 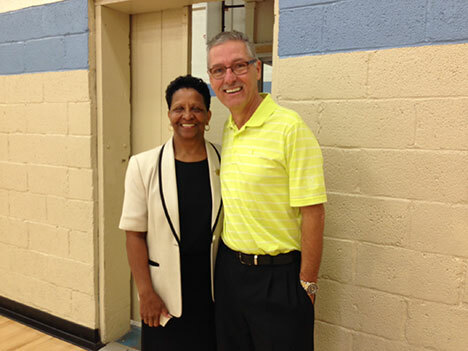 Mark is pictured here with the dynamic director of that club, Yvonne Hollins. In 2015 the Foundation’s budget will be $18M and we will touch a million kids, coaches, and mentors. I wonder sometimes- given the clout that respected celebrity athletes have in this country- why in this day and age that to date this has proven exceptional. As I think about the Foundation’s future, my hope is that it continues to broaden and deepen its involvement in hundreds of communities across the country. Ideally, CRSF will be able to leverage its knowledge and experience so that it’s partners, especially local Boys and Girls Clubs, greatly enhance the dollars and volunteers available to them. Cal, as I look at this photo I can only say, “Who Knew”! Thanks for the ride! Whether it is just a gathering of close old friends, large families, or retired athletes, inevitably there is a ritual of telling and re-telling stories and jokes. At lunch Harold Reynolds delighted in telling when he played with the Orioles how he was fined by the team’s kangaroo court. To hear Harold tell it: he was living in downtown Baltimore, tired of the traffic getting to the ball park, and asked Cal for a bike shop recommendation. A few days later he rode his new bike to the ballpark, dressed, and went out to play. When he came back he found one tire in his locker, the other in the shower, and the handlebars and frame suspended from the ceiling. He accused Cal of instigating and appealed to the kangaroo court for restitution and the levying of fines. Reynolds “lost” and instead was fined for “bush league” behavior, riding a bike into the club house. Cal told him he embellished. Regardless, it made for a good story and one easily remembered.